The African Peer Review Mechanism (APRM) is an innovative and challenging initiative in the field of African governance. EISA, because of its extensive experience in African elections, is uniquely placed to assist in the analysis of democratic and political governance. Through the APRM proramme, EISA has been involved in establishing regional networks such as the SADC Electoral Support Network and the Electoral Commissions Forum of SADC countries and its development and promotion of the PEMMO which has been recognised as a valuable standard for election observation in several SADC states. EISA's expertise in this regard has been recognised by the African Union which invited EISA to assist in drafting the AU Electoral Guidelines and the AU Charter on Elections, Democracy and Governance. EISA APRM along with the Wits School of Governance and AFRO-OSF (Open Society Foundation), wrote two comprehensive reports analysing and interrogating the compliance of South Africa and Zambia with the APRM, African Governance Architecture (AGA) and AU Protocol on Combatting and Preventing Corruption (AUPCC). In compiling this research, there was South African CSOs engagement which took place in Cape Town from 6 - 8 July. In partnership with the Tanzania Citizens Information Bureau (TCIB), EISA organised a series of seminars and training events in Dar es Salaam from 18 - 22 July 2016. The objective of the trip was to highlight the recent reports published by the EISA APRM programme, and launch the latest report produced by Rorisang Lekalake on the APRM and Corruption (AP 6). A full day seminar discussing the report findings was attended by 58 participants, and included contributions from the Tanzania APRM structures, Ministry of Constitutional Development, and AfroBarometer. Further training sessions were held with 33 representatives of youth in civil society (both youth-focussed CSOs and young people working in unrelated CSOs). These sessions were augmented by the presence of the Kenyan APRM Youth Working Group, a group that was formed out of EISA's engagements in Kenya in 2015. The training sessions elicited a massive response from Tanzanian youth, and indicated that a new generation of civil society are ready and eager to engage the mechanism going forward. A continental workshop, The African Peer Review Mechanism in Southern Africa: Exploring Synergies with the Southern African Development Community, was held in Gaborone in May 2015. It was the first such meeting under the APRM calendar as well as the largest event ever organised on APRM by non-state actors. The organising partners anticipated approximately 100-120 participants however the final figure was 183, showing the demand for such activities. The event enabled civil society and the media, for the first time to sit and engage with the principal decision makers in the APRM. The keynote address set the tone for the entire workshop, with Dr Mekideche admitting that the APRM process was at a crossroads from which it had to either reinvigorate itself, or disappear into obscurity. Listing the practical and political limitations of the APR Panel, it was encouraging to hear Dr. Mekideche recognise the importance of civil society in re-energising the APRM going forward. The African Peer Review Mechanism (APRM) Support Programme at EISA was established in 2004, making 2014 the 10th year the programme has been in operation. In the past 10 years, the African Peer Review Mechanism (APRM) programme has remained one of the key channels through which EISA supports citizen and civil society organisations' participation in democratic processes. Notable activities during the year included attendance at AU Summits and subsidiary events, the execution of a seven-country opinion survey on the attitudes of non-state actors towards the APRM, supplemented by country fieldwork research missions, and ultimately dissemination conferences in two of the seven countries (with the others following in 2015). Programme achievements included a comprehensive and detailed database of registered non-state actors in the programme countries, detailed insight into the prevalent views of non-state actors around governance and the APRM, and survey data from more than 400 respondents to the survey across the seven countries. Produced seven country fieldwork reports and a comprehensive statistical analysis report of the survey data. The EISA APRM programme also focusses on capacity building of key stakeholder groups in the target countries. The results of EISA's survey and fieldwork research were shared with interested country-level stakeholders in two of the programme countries in November 2014.
rededicate themselves to the principles espoused in the African Union founding documents, as well as the APRM, and strengthen the continent's governance review system through deeper and more consistent support from Africa's leaders for the APRM. The APRM programme increased in size from five to eight countries, and spread its scope to include other APRM signatory states beyond the Southern African Development Community (SADC). 2012 further saw the realisation of the long term goal of EISA'S engagement in the APRM programme to develop a sustainable and capable unit whose function is to utilise the opportunities provided by the APRM to engage on critical governance questions and issues in its delivery with the increase in the staff complement in this programme. EISA, in partnership with the Mauritius Council of Social Services (MACOSS) and the National Economic and Social Council (NESC) hosted a two-day conference for Mauritiuan stakeholders in the APRM on 22-23 January 2012. The event, which was attended by 84 representatives of Mauritian society, met to discuss a civil society engagement plan on the Mauritius National Programme of Action (NPoA). Representatives from the South African and Kenyan National Focal Point ministries met on the 24th with the NESC council to engage on taking the discussions held with civil society organisations forward (the NESC is the national focal point for the APRM in Mauritius). The presence of the NESC and key Mauritian ministries in both the workshop and the post-conference discussions added significant value to proceedings. The conference also received widespread media coverage on Mauritian state TV and radio. At the request of various civil society organizations in Mauritius, EISA attended and presented at a two-day meeting hosted by the United Nations Development Programme and the United Nations Economic Commission for Africa (UNECA) on Harmonising the Mauritius National Programme of Action with existing development frameworks and the Medium Term Expenditure Framework. The meeting, which took place on 23-24 April 2012, was largely attended by the state and civil servants although with a small representation from civil society. In the area of the African Peer Review Mechanism (APRM) programme, EISA has established relationships with in-country partners to implement the programme in their respective countries. These inter-organisational relationships were strengthened during 2011. Apart from country partner organisations working with EISA on project implementation, EISA included the country partners to be a part of the evaluation of the EISA APRM programme as well as contribute to the design of a new phase of the programme at the termination of the existing phase. During 2011, EISA held three in-country national conferences in Tanzania, Zambia and Mozambique, as well as convened a summative end-of-programme conference to draw together the lessons learned during the four-year APRM programme. The summative conference was also used to shape a future phase of the APRM programme in order to ensure that EISA's programme design remains appropriately consistent with addressing the priority needs and challenges identified by country stakeholders themselves. In partnership with the APRM Secretariat in Tanzania and the Legal Human Rights Centre (LHRC), EISA hosted a two-day conference for Tanzanian stakeholders in the APRM on 18-19 May 2011. The event, attended by 113 representatives of Tanzanian civil society and government (including 15 representatives from Zanzibar), discussed the state of the APRM in Tanzania, the government's commitment to the mechanism and the possibility of establishing a CSO network to coordinate responses from CSOs to APRM developments. Tanzanian CSOs expressed their firm commitment to the APRM process, regardless of funding constraints, indicating that they would adopt a strategy of 'action now, funding later' in order to strengthen CSO participation in the APRM. The participation of official APRM institutions in the workshop added value to the whole conference. EISA, in collaboration with the Zambian National Governing Council and the Civil Society Organisations' APRM Secretariat, hosted a workshop on the 10-11 August 2011 in Lusaka to discuss CSO preparations for the adoption of the Zambia Country Report and the implementation of its National Programme of Action (NPOA). The workshop was attended by 47 representatives from civil society and state institutions, which, in the context of the impending national elections in the country, demonstrated the extent of the commitment from CSOs to the APRM in Zambia. Zambia is the first country where civil society took the proactive step of forming a network to coordinate its response around the APRM and this model has been inspirational to other APRM signatory states in the region who have sought to emulate this model. EISA, in collaboration with the Mozambique National Governing Council, and supported by the EISA Mozambique field office, hosted a workshop on the 22-23 November 2011 to discuss the popularization of the recently translated APRM Country Report from its original English into the more widely accessible Portuguese, and CSO preparation and coordination in response to the country's NPOA. The meeting was attended by 74 representatives from CSOs and state institutions, and drew on comparative experiences from the lessons learnt by the South African National Governing Council (NGC) members who participated in the workshop as resource persons. to their participation in the APRM process. Conference on "Taking peer learning to the next level"
In collaboration with the Mauritius Council of Social Services (MACOSS), EISA hosted a two-day conference in Mauritius on 23 and 24 September 2010, the aim of which was to enhance the understanding and capacity of Mauritian NGOs to monitor the recently developed National Programme of Action (NPoA) by non-state actors. Drawing on a broad range of experiences and stakeholder inputs, and attended by 97 representatives of Mauritian society, the conference stimulated the engagement of CSOs to monitor the exercise. To provide an opportunity for peer learning and exchange of experiences, Ms Susan Mwape from Zambia's CSO APRM Secretariat shared Zambia's experience. 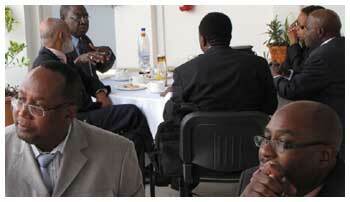 has enabled Zambia's CSOs to impact on the country's APRM process. In collaboration with the Civil Society APRM Secretariat, EISA hosted a conference in Zambia which focused on a the forthcoming Zambian Country Review Mission which was to be organised by the APRM Secretariat. Attended by 63 representatives from Zambian civil society, including the Chairperson and Vice-Chairperson of the National Governing Council for the APRM in Zambia, the event provided an opportunity for diverse interest groups to co -ordinate their collective responses to the APRM prior to the arrival of the Country Review Mission. The period under review saw the deepening and expansion in awareness of the relevance and significance of the APRM amongst non-state actors increase significantly as evidenced by the numerous requests made to EISA to provide technical assistance, make inputs and present papers at various meetings and workshops on the APRM. creation of a structured forum of CSOs engaged in the APRM at continental level, aimed at improving the flow of information about APRM activities between the forum's members. The United Nations Economic Commission for Africa (UNECA), one of the APRM's strategic partner organisations, also took the initiative to host a follow-up meeting in Addis Ababa in February 2009 to further the discussions which took place in Maputo during the Symposium. EISA received several requests during the year to provide technical consultancy services to various organisations regarding the APRM and governance issues arising from the mechanism. The most significant of these was the participation of EISA's Director of Programmes, Dr. Khabele Matlosa, in the Ugandan Country Review Mission, which took place from 3rd to 24th February 2008. Dr. Matlosa participated in the mission as an expert in the thematic area of Democracy and Political Governance. 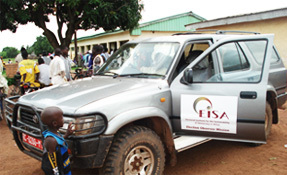 EISA furmore, received several requests throughout the year for consultancy services from civil society organisations in South Africa, Tanzania, Kenya and Malawi. The Economic Commission for Africa (UNECA) conducted a three day workshop for Anglophone Parliamentarians on the African Peer Review Mechanism from 12 – 14 November 2008. EISA, the Afrimap project of the Open Society Foundation and the South African Institute for International Affairs (SAIIA) made a series of presentations addressing areas of cooperation between Parliaments and civil society vis à vis the APRM. 2007 successfully saw the implementation of a pilot project aimed at "enhancing civil society participation in the APRM in Southern African States." EISA has further taken steps to expand the pilot project into a multi-year programme, providing EISA's APRM activities with a stability and longterm focus that had previously been a challenge in APRM activities and interventions. Mozambique National APRM Conference – EISA provided technical support to the Mozambique MARP Technical Unit and National Forum as that country launches its self assessment process. A national seminar was held in Maputo on 20 – 21 August to deliberate on the APRM implementation. The APRM Toolkit for civil society, developed and published by EISA, was launched in August at the Mozambique National APRM Conference. EISA conducted a fact-finding mission to Maputo, Mozambique to identify and assess the preparedness and levels of awareness of civil society organizations in Mozambique in relation to the APRM.